Apple has released iOS 12 developer beta 12, alongside iOS 12 public beta 10. The beta build for both beta releases is 16A5366a. Notably, the update resolves the constant “A new iOS update is now available. Please update from the iOS 12 beta.” pop-up message that was appearing nearly constantly on every iPhone and iPad devices that were running the prior beta versions of iOS 12. 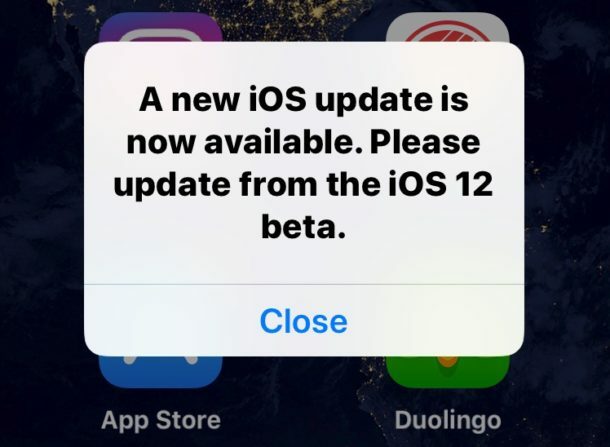 It appears that updating to this new version of iOS 12 beta is the only reliable way to get rid of that message pop-up, making the software update recommended for any and all users actively running iOS 12 on an iPhone or iPad. The software update is available to download now from any iOS device on a prior iOS 12 build by going to Settings > General > Software Update. 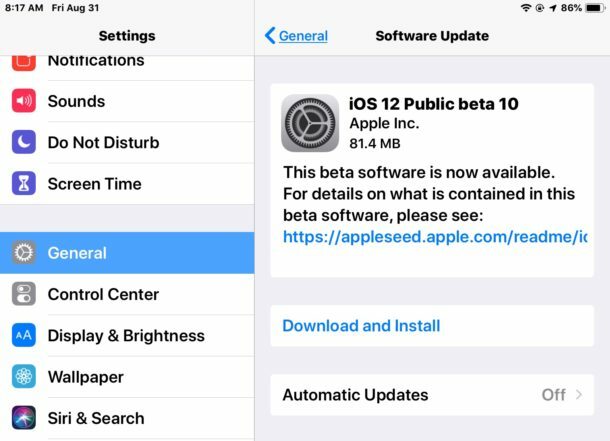 Whether the update is labeled as iOS 12 developer beta 12 or iOS 12 public beta 10 depends on which version of the beta you are running, but regardless of labeling it’s the same build and software release. The latest beta update likely includes various bug fixes and feature enhancements as iOS 12 nears completion. Separately, new beta updates are available for watchOS 5 and tvOS 12 for users beta testing system software on their Apple Watch or Apple TV respectively. MacOS Mojave did not receive a beta update today, yet at least. The persistent alert message stating “A new iOS update is now available. Please update from the iOS 12 beta.” was so ubiquitous and annoying that an equally ridiculous parody song has been made about the bug featuring bad lyrics pieced together from twitter users complaining about the constant update message, which you can listen to below if you want a laugh (hey, it is Friday after all). Anyone can install the iOS 12 public beta if desired by signing up for the beta testing program. Likewise the developer beta can be installed by anyone with an Apple developer account. The final version of iOS 12 is due this fall. Apple has scheduled an event for September 12 where the company is likely to launch new iPhone models, as well as provide a precise release date for the final versions of iOS 12, macOS Mojave, watchOS 5, and tvOS 12. As a result of your feedback, there are software changes in build 16A5365b that may have resolved this issue. Is this issue fixed for you in this build? If you are still seeing this issue, please provide any reproduction steps so we may investigate further. Thanks for your feedback! Do not reply to this email. Please log into Feedback Assistant and let us know if the problem is fixed for you. Maybe now the APP store will open in X? My Software Update says “iOS 12.0- Your software is up to date”. And I do have the persistent notification as well. Plugging in and connecting to wifi makes no difference. I kept getting this, and it fixed when I removed the old developer profile and reinstalled from the beta.apple.com site. Don’t know if it was that specifically that did it, or whether I just got this new update, but it’s gone now. Memoji requires a new enough iPhone that supports the feature, not all models will support Memoji unfortunately. Was the feature available on your device but now it is not? What model iPhone are you using? Very helpful blog! This iOS Version is better than the old version. Now this version giving new functionality like Camera app, Photos app, Siri Shortcuts, Group FaceTime, Animoji changes. Thank you.